I made it onto the stage at TEDxSydney! How in the world did I manage that? Somewhere between buzzing with emotion documented in my last blog post and feeling the ideas-love coming from the rest of the delegates, I found myself pitching my 30-second 'Idea worth sharing' to the organisers and landed myself on stage with a dozen other brave and clever souls. I won't lie, I nearly didn't pitch my idea. I mean, 2200 audience members in the flesh and who knows how many more watching the live stream. I didn't feel like I had enough time to really polish my idea. Would everyone think "well, duh, that's hardly original"? 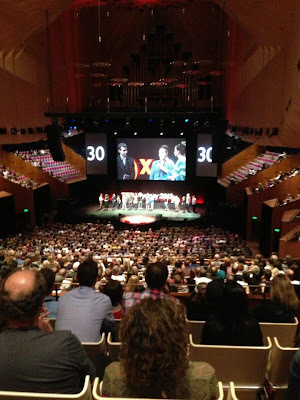 But I gathered up my courage and pitched my idea, and soon after found myself on stage at the Sydney Opera House with Gretel Killeen holding my microphone. "Do you know where your top came from? Or your dress? Do you know where it really came from? Perhaps when we can all be fully informed purchasers, we can demand responsible practices from our labels, suppliers and retailers, and we will finally see the end of tragedies such as last week's Bangladesh garment factory collapse." I was nervous, so I'm sure it didn't come out as smoothly as that, but you get the point. And afterward I had many people come up to me and say they liked my idea, that I was brave to get up there, and not to ask them where their dress was from. Ha ha - cute! I'll try and get a better photo and/or video, but for now, score 1 for spreading the message about sustainable fashion!